These past weeks, I have been too busy to blog. Someone noted last night, that I am like everyone in LA “keeping extremely busy to feel that I am having a full-life.” Work, a flu and more work are my only excuses. Financial woes too and cramming everything into some time allotment. I submitted an application for a grant, and tried to file more, but on the other applications I was either too late or too early. It seemed like destiny was saying, “move on to the next thing.” It is said that there is some easy flow, when things are meant to be. I am still trying to experience what that might feel like. My life is struggle, struggle and then some more of the same. Latched onto someone’s else’s star, I have been invited to present my art work at a conference in France this December. 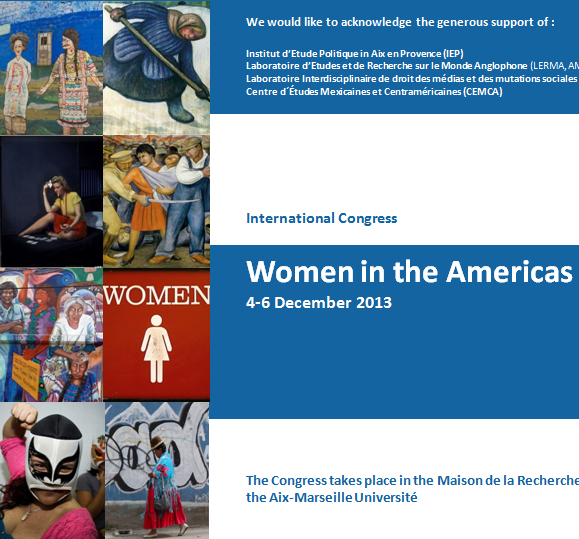 Institut des Amériques’ “Women in the Americas” conference in partnership with, the Centre for Mexican and Central America Studies (CEMCA) in its 11th edition of organizing this conference—this year taking place in Marseille, France. The congress will analyze the continuities and changes in roles, identities and representations of women in the Americas. It will be held in English, French and Spanish and will lead to several international publications. Publication(!) Yes, I am writing like crazy, trying to document what my art is about in 6000 words, English and Spanish. My mind wanders with all the ideas that I have and sometimes contradicting my panel: “Feminist Interventions: Art and Community Building in a Transnational Era.” Writing about what one does, when one likes to be behind the scenes is a mega challenge, coupled with getting the finances together to travel and find accommodations–a race that is neck and neck. Wish I had people, like other artists do. It occurs to me that maybe I have “let go” as an artist, and it’s only in my mind that I think I am such a controller (even when behind the scenes). I am going to ponder that more. My mind is all over the place these days. Anyway this is the spot look for us in “Axe 8 Arts” —I am getting ready to make my European debut. Wish me luck!